Kamella is a boss character that appears in Super Mario Galaxy. She is a Magikoopa who wears a purple robe, crystal colored claw polish, green lipstick, and a red jewel on the center of her chest. Her appearance is reminiscent of Kammy Koopa from the Paper Mario series. She is first fought in the Space Junk Galaxy and is encountered two more times in the Deep Dark Galaxy. Whether it is her natural size, or due to some sort of magic from the Power Star in her magic wand, Kamella is much bigger than other Magikoopas. Kamella's model as seen in Super Mario Galaxy. Kamella, like all Magikoopas, wears a flowing robe and long pointy hat, like that of a witch. She also has light blue claw polish and green lipstick. 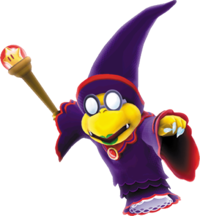 One minor difference between her and other Magikoopas is that her fangs point upward, while other Magikoopas' point down. Her legs are not seen. She also wields a magic wand which houses a Power Star in its orb. Kamella's first appearance in Space Junk Galaxy. Kamella generally alternates between shooting fireballs and Green Shells at Mario. She also has the ability to summon other Magikoopas to her aid. To defeat Kamella, Mario must grab the Koopa shells she summons and toss them back at her. As she takes damage her attacks become increasingly dangerous (for instance, she begins firing multiple fireballs at once). When Kamella uses her scepter to throw fireballs or shells, fireballs will appear as a red-orange streak and a shell as a green one. Kamella starts the fight outside the boundaries of the ship. Mario must simply throw the shell to hit her. Once hit, she will move onto the ship. Then the player will have to jump and throw the shell to hit her, since she will be floating above the deck of the ship. If the player does this successfully, the shell will hit her the second time. Kamella then stays in her position above the deck of the ship and summons two Magikoopas to her aid. Using the Star Spin, it is possible to grab nearby shells much more easily; even if they are moving, and even if they haven't formed yet - the Star Spin will successfully take the shell if used next to one of Kamella's green spells. This tactic makes the battle much easier, as the player does not have to wait for the shells to stop moving before collecting them. The Magikoopas will disappear and reappear when Kamella is injured. If done correctly, Kamella will hurtle into space, dropping her scepter that has the Power Star inside of it. The scepter will shatter, exposing the power star for the player to collect. Kamella later appears two more times in Deep Dark Galaxy, once under normal conditions and once with a Daredevil Comet surrounding the galaxy. In this fight, Kamella has the ability to turn into a white orb and teleport to random places on the ship, on which they are fighting and requires four hits to defeat instead of three, making the fight more difficult. The last two hits require the player to follow Kamella to the crow's nest of the ship, and when she summons the two Magikoopas, it can be difficult to avoid all three Magikoopas' fire attacks. When she is defeated, Kamella will vanish and drop the wand, shattering the orb and releasing the Power Star for Mario to collect. From the Moon in Deep Dark Galaxy. Mario battling Kamella on the ghost ship of Deep Dark Galaxy. Mario fighting Kamella under Daredevil conditions. Mario fighting Kamella on the crow's nest. This page was last edited on December 20, 2018, at 06:08.